Polyurethane floor finishing with AHF Vancouver's All hardwood floor ltd Traditional Economy value sealing finishing for real solid hardwood floor and stairs pre sanded Craftsmanship since 1979 Ken has been professionally sanding and finishing residential homes in and around the BC lower mainland chances are i may have re sanded an old hardwood floor in your very own Vancouver neighborhood . One day Polyurethane hardwood floor refinishing is the number one seller entry level floor refinishing service because of the lower costs involved. The secret to a great polyurethane finished hardwood floor is always the sanding of the wooden floor after all preparation is everything right! Sanded wood flooring should be smooth as a baby's bum. 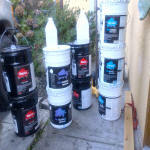 The sealer needs to be fast dry so many layers can be applied before rolling on the one coat of polyurethane floor finish. 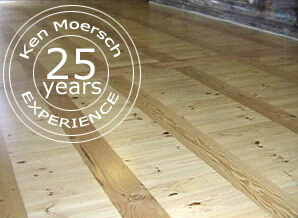 This means you must seal the floor to an even sheen before rolling on the polyurethane wood floor coating. 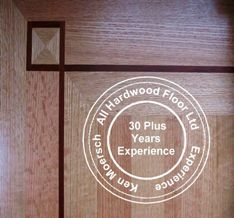 AHF All hardwood floor ltd has a great advantage with our Cadillac's sanding machines the American Twelve floor sander machine, Simply put the best twelve inch floor sander machine ever made. In the case of a stained colored wood floor followed by an American Floor crafter eight inch Belt Machine the best eight inch belt machine ever made. Read more on the sanding preparation! The polyurethane coating is generally the color of light amber and will yellow dramatically within the first year, The typical system for a one day finished polyurethane coating is to use a fast drying sealer and trowell the surface with a large steel plate dragging the surface with the sealer. Lacquer sanding sealer U-200 is the wrong sealer because it does not have any penetration and is incompatible with polyurethane. Once dry nothing else will stick to lacquer except lacquer itself so the trick for this is to roll your coat of polyurethane over this lacquer before it has evaporated. We use the Glitsa Bacca floor sanding sealer instead it is compatible and has great penetration and high build to create a great seal.